لندن - تم اكتشاف عنكبوت عملاق في جزيرة مدغشقر، يعتبر الأكبر من نوعه في العالم بعرض 25 مترا. كما تمثل المادة التي تشكل جسم العنكبوت اشد المواد الحية المعروفة حتى الآن صلابة. وينسج العنكبوت الذي أطلق عليه اسم "عنكبوت لحاء داروين" شبكته العملاقة فوق مياه الأنهار الجارية بحيث تمتد من ضفة إلى أخرى. والشبكة من الضخامة بحيث يمكنها أن تقتنص 30 حشرة أو أكثر في المرة الواحدة. وينسج هذا العنكبوت ما يطلق عليه الخبراء اسم "الشبكة المكورة" وهو الشكل المألوف من شبكات العنكبوت. إلا أن شبكة "عنكبوت لحاء داروين" مختلفة من حيث أنها أكبر شبكة مكورة ينسجها عنكبوت حي حيث تبلغ مساحة أكبر شبكة تم رصدها حتى الآن 2.8 مترا مربعا. وتقول البروفيسورة إنجي أجنارسون ـ مدير متحف الأحياء في جامعة بورتوريكو في سان جوان وعضوة الفريق الذي اكتشف العنكبوت العملاق ـ إن العنكبوت ينسج شبكته وجسمه معلق رأسيا فوق مياه النهر أو البحيرة، وهي بيئة لم يعد باستطاعة العناكب الحياة فيها. وتضيف أجنارسون أن هذا الوضع يمكن العنكبوت من اصطياد الحشرات التي تطير فوق المياه، وهذا يفسر مدى طول شبكة العنكبوت. Darwin's bark spider (Caerostris darwini) is an orb-weaver spider that produces one of the largest known orb webs, with anchor lines spanning up to 25 metres. The spider was discovered in Madagascar in the Andasibe-Mantadia National Park.The species was named in honour of the naturalist Charles Darwin, with the description being prepared precisely 150 years after the publication of The Origin Of The Species, on 24 November 2009. Its silk is the toughest biological material ever studied ever studied, over ten times stronger than a similarly-sized piece of Kevlar. The average toughness of the fibres is 350 MJ/m3, and some are are up to 520 MJ/m3 making the silk twice as strong as any other spider silk known. The web of Darwin's bark spider is remarkable in that it has not only the longest spanning web ever observed, but is among the largest orb webs ever seen, at an area of up to 2.8 m2. 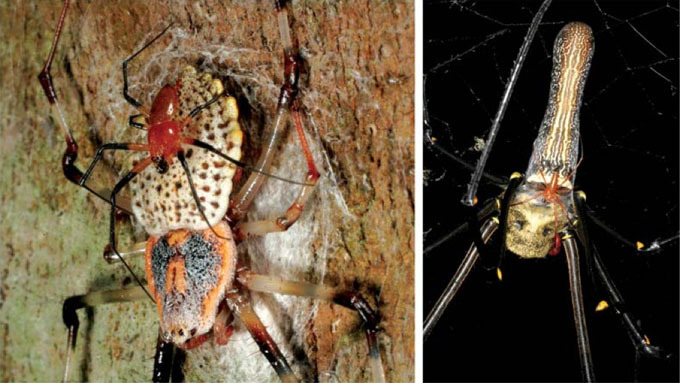 Nephila komaci, discovered in 2009, and some other Nephila species also make webs that can exceed one metre across. According to professor Ingi Agnarsson, director of the Museum of Zoology at the University of Puerto Rico, the spider's web occupies a unique biological niche, stating: "They build their web with the orb suspended directly above a river or the water body of a lake, a habitat that no other spider can use". This position allows the spiders to catch prey flying over the water, with webs observed to have contained up to 32 mayflies at a time. The strong silk and large web are thought to have coevolved at the same time, as the spider adapted to the habitat. Scientists are currently researching how the spider is able to weave such a large web over water along with being able to anchor drag lines on either side of a river. Like other spiders of the genus, Darwin's bark spider displays extreme sexual dimorphism, with the large females and small males. Last edited by Kain; 09-21-2010 at 08:55 PM.